Confucianism Beliefs - What are the beliefs of the Confucian religion? There is considerable debate about whether Confucianism should be properly considered a religion. While it prescribes many rituals, very little of it seems like worship or other religious practices. Additionally, Confucius made some statements, which to modern Western ears, sound distinctly agnostic. Confucianism is based on the Five Classics, the basic texts of Confucianism. Traditionally authorship, or least editorship, is attributed to Confucius himself, although some modern scholars have raised doubts about this. I Ching - The Book of Changes. It combines metaphysics, divination, numerology, ethics, and philosophy. The universe is described as the interaction of two energies, yin and yang. Classic of Poetry - The Book of Songs - The earliest known anthology of Chinese poetry. Book of History - A compilation of speeches, records of historical events, and contains political and ethical vision for humane government. Book of Rites - Describes society, adminsistration, and ceremonial rituals. Encourages social responsibility and cooperative living in communities. Spring and Autumn Annals - Describes the historical period from 771 to 476 BCE and emphasizes the importance of collective living and identification. Confucian thought encourages virtues such as humaneness, righteousness and justice, propriety, knowledge, integrity, loyalty, and filial piety. The most basic of the virtues encourage is altruism and humaneness for other individuals (Ren), which is summarized in one of Confucius' most famous quotations: "What you do not want done to yourself, do not do to others.". 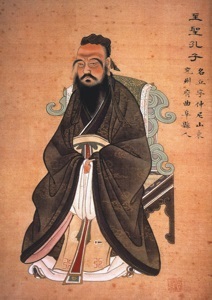 Confucian thought also encourages rituals (li). Rituals not only incorporate religious rituals, but also the rituals and etiquette of everyday life. The purpose of rituals is encourage a contented society, containing contented people. A key goal of Confucianism is social harmony, and filial loyalty (the respect of children for parents), and the Five Bonds (ruler to ruled, father to son, husband to wife, elder brother to younger brother, and friend to friend), each with specific duties, exist for this purpose.